Spartans boss Dougie Samuel branded his side’s performance unacceptable as the Capital outfit were held to a frustrating 2-2 draw by Vale of Leithen. Recent signing Ross Allum had given the hosts an early lead before the game was turned on its head through Thomas Paterson and Jason Stevens goals. However, substitute Jonny Grotlin salvaged a point for the Ainslie Park men with just three minutes remaining. 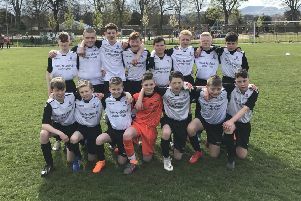 Samuel also conceded his players now face an uphill struggle in their quest to finish second behind champions-elect East Kilbride after failing to close the six-point gap on East Stirlingshire who, 24 hours previously, had fought back to secure a 3-3 draw at Cumbernauld Colts. “I’m pleased we didn’t lose but really disappointed in the performance as we can play a lot better than that,” Samuel said. “To be perfectly honest, it was unacceptable. The starting eleven we put out should be good enough to go and win the game. I think we suffered from a real lack of leadership and some of our younger players are going through a wee sticky spell just now and have allowed some self doubt to creep in. They’ve got talent and ability but they’re just a wee bit short on confidence at the moment. Samuel was forced to play a trialist in goal as first-choice goalkeeper Blair Carswell was on holiday while back-up Ross Gilpin had just become a father for the first time on Friday night. Vale, meanwhile, included Spartans legend Keith McLeod in their starting line-up. Allum could have found himself on the scoresheet prior to his opener midway through the first half, catching first glimpse of the Vale goal inside two minutes only to drag his shot a couple of inches past Andrew McQueen’s right-hand post. The hosts were fast out the traps and somehow failed to capitalise on an in-swinging Jack Beesley corner as the ball went through a ruck of players before creeping out of play. The visitors, though, also looked dangerous on the break as Stevens jinked his way into the box only to shoot wide when it looked easier to score. Spartans seized the initiative as Beesley was first to the ball ahead of McQueen and, with the visiting No.1 out of his goal, striker Allum coolly lobbed in from 18 yards via the post. The former Edinburgh City striker brought out the best of McQueen just a minute later as the Vale keeper palmed away a thunderous drive from a tight angle. Beesley and Allum were causing havoc in the Vale defence and the latter was again denied by McQueen from point-blank range just before the half-hour mark. The visitors drew level nine minutes before the interval when McLeod picked out team-mate Paterson at the back post and the winger volleyed into the roof of the net. Beesley tried his luck from distance shortly after the restart but the hosts soon found themselves trailing as Stevens curled in a superb free-kick from 20 yards following an infringement by defender Chris Townsley. Allum was again thwarted by McQueen following Jamie Dishington’s incisive pass before Stevens and Sean Stewart threatened to increase Vale’s lead. But, with just three minutes remaining, substitutes Jack Hay and Grotlin combined to rescue a point. Spartans: Trialist, Dishington (Grotlin 80), Maxwell, Tolmie, Stevenson, Beesley, Murray (Hay 63), Allum, Mair, Comrie (Grant 63), Townsley. Subs: Corbett, Trialist. Vale of Leithen: McQueen, Scott-Mercer, McIntosh (O’Donnell 90), Lynch, McBride, Manson, Stewart, Smith, Stevens, McLeod (Hunter 76), Paterson (Trialist 65). Subs: Lamb.